Recently retired star racemare Black Caviar is kicking back and learning how to be a horse again following the end of her racing career, but she’s still in the money. The unbeaten winner of 25 races has been immortalised in a commemorative coin issue, and also in an Australian postage stamp. A $1 collectible coin made out of silver and a $1 collectible aluminium bronze coin was officially launched at the 2013 World Stamp Expo in Melbourne on May 11 in the company of all of the champion’s trophies, also on display. Five thousand silver $1 coins were made and are already sold out, but a two-coin proof set is to be released soon. “The story of Black Caviar will be told for years to come as a tale of inspiration and determination and we wanted to create a collection that showcased this incredible feat and helped tell that story,” said Royal Australian Mint CEO Ross MacDiarmid. Having 25 consecutive wins under the belt, Black Caviar is going down in the history books with many remarkable achievements including a world record. With the tagline ‘perfection’, each design features Black Caviar in mid-stride racing to the finish line. 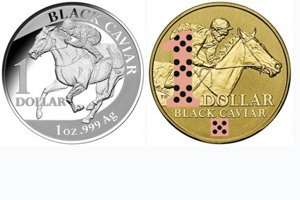 The $1 silver proof collectible coin retailedfor $120 and depicts an artistic impression of horse and jockey, whereas the frosted uncirculated coloured coin retails for $16.95 and highlights the well-known salmon and black spots of Black Caviar’s silks. Australia Post also got in on the act and released a commemorative domestic (60 cent) stamp to celebrate Black Caviar’s 25th consecutive win and retirement. “The nation has been inspired by the great Australian champion Black Caviar and we wanted to create a memorable stamp featuring one of Australia’s true racing champions for everyone to collect,” said Australia Post Managing Director and CEO Ahmed Fahour. All of the trophies won by the champion racehorse were showcased at the Expo in an exhibit held in partnership with the Australian Racing Museum. Black Caviar’s retirement was announced on April 17 following her unbeaten race career, which included a record-breaking 15 Australian Group 1 victories. In 2011 and 2012 she was voted Australian Champion Sprinter and Australian Horse of the Year and in 2013 was inducted into the Australian Racing Hall of Fame. Her 25 consecutive wins constitute a world record for horses of the modern age competing at the elite level. A decision is expected today on a suitor for Black Caviar. The 2013 World Stamp Expo brought together national and international stamp dealers, exhibitors, postal administrators, traders and collectors from more than 60 countries. The event was the second-largest international philatelic exhibition ever held and displayed a range of collections valued at more than $A300 million. For information on the Black Caviar coins, contact the Royal Australian Mint Call Centre on 1300 652 020, online https://eshop.ramint.gov.au or in store in Deakin, Canberra. The Black Caviar stamp is available from participating Australia Post retail outlets, via mail order on 1800 331 794 and online at auspost.com.au/stamps while stocks last.